Marek can do it! It doesn’t matter how small or large the class is that you need to accommodate, we can handle it. 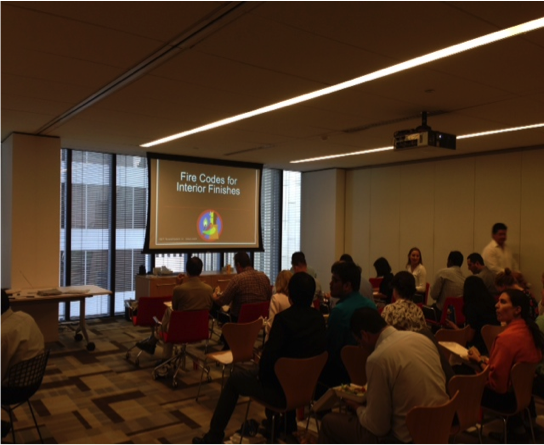 We recently had the pleasure of presenting “Fire Codes for Interior Finishes” at Gensler Houston. Two screens, lunch, the presentation and some very good questions from the professionals sums up the successful event. We continue to have good feedback from our design partners including Ziegler Cooper, Gensler Austin and PDR where we have presented recently. Marek offers two AIA-CES courses that qualify for Health, Safety and Welfare CEU credit hours. One of these courses called “How Sound is Your Design?,” reviews the basics of acoustics, terminology and even signs that alert you when to call your favorite acoustical consultant. The other course we offer is “Fire Codes for Interior Finishes,” which looks in-depth at building codes and fire testing with special emphasis on ASTM E84 requirements. Both courses are an hour long and can fit nicely into your firm’s Lunch and Learn schedule. Give us a call, and we will deliver.